Lilly has acquired worldwide rights to Locemia’s phase 3 intranasal glucagon powder for severe hypoglycemia. No deal terms have been disclosed. The improved glucagon rescue device has completed phase 3 studies in adults and pediatrics. We wonder if an NDA submission could occur sometime next year. Locemia will likely be first to market with a better glucagon rescue device, as Xeris and Biodel have not started phase 3. 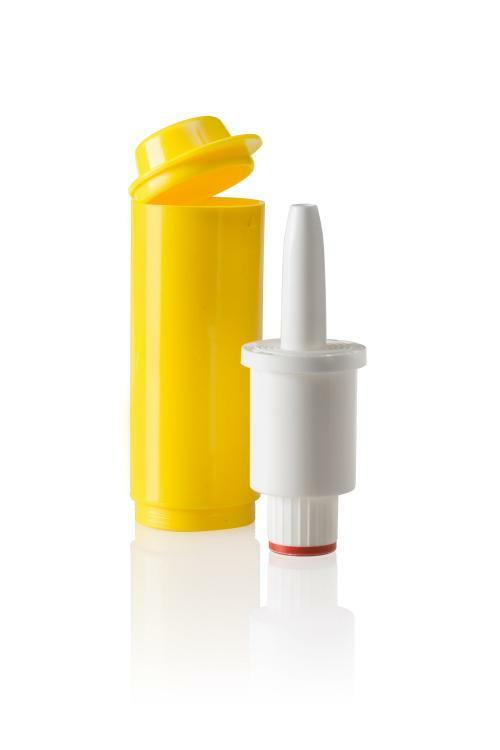 Minutes ago, Lilly announced the acquisition of Locemia’s phase 3 intranasal glucagon powder for severe hypoglycemia. No deal terms have been disclosed; the deal grants Lilly worldwide rights to bring it to market. The asset will fall under Deirdre Ibsen's group (hurrah - an incredibly talented, very senior leader). We wonder if an NDA submission could occur sometime next year; the company could not confirm submission timing. The deal combines Locemia’s dramatically improved glucagon rescue device (see pictures below and a video here) with Lilly’s long-standing glucagon experience and commercial firepower (such as it is - glucagon hasn't been a major priority until this move from an outsider's view). Lilly has always been one of the most likely partners for Locemia; they are one of two manufacturers in the global glucagon market (the other is Novo Nordisk), recording sales of ~$100 million in 2014. We believe Lilly has acquired a fairly low-risk product with high potential to improve patient outcomes. The biggest unknowns are regulatory, manufacturing, and pricing – certainly Lilly has lots to offer on all those fronts, though no new products like this are without risks. Locemia has completed phase 3 studies of its glucagon in both adults (ATTD 2015) and pediatrics (EASD 2015), showing glucose-raising equivalency to injected glucagon. A real-world human factors study shown at EASD was very impressive – it highlighted both the simplicity of Locemia’s device and the challenge of current glucagon injection kits. Lilly plans to continue making its glucagon injection kit, though we assume sales will decline over time given the advantages of Locemia's device. Xeris’ auto-injector was expected to enter phase 3 this year, though it does not look like it has based on the company’s pipeline. Biodel’s auto-reconstitution device could enter a pivotal study in 2016, assuming it resolves delay issues with its partners Unilife and Emergent. An NDA submission won’t happen until at least early 2017. Zosano’s microneedle patch for severe hypoglycemia is in phase 2, and results were expected in 3Q15. It is not a good sign that both Novo Nordisk and Lilly have called off other drug partnerships with the company (for GLP-1 and parathyroid hormone, respectively). Zealand has completed phase 1 for its liquid glucagon analog for severe hypoglycemia. We see this news as a major win for patients, caregivers, and emergency responders, as Lilly will bring the regulatory and commercial experience to get this much-improved device out to the masses. It's also a big win for Lilly, who has reinforced its major commitment to severe hypoglycemia, a condition responsible for nearly $5 billion in annual costs in the US alone (see our estimates below). Last but not least, what a victory for Locemia's leadership team of Robert Oringer, Claude Piche, and Martin Lafontaine, who have diligently carried this through phase 3, largely in stealth mode. Below, we include more on the device, our key questions, and the presentations from EASD and ATTD. How Much Does Severe Hypoglycemia Cost in the US Annually? 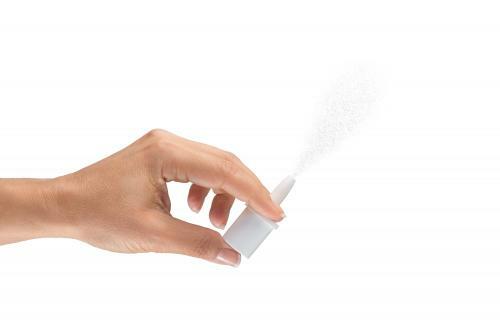 The plastic Locemia device fits in the palm of the hand and contains a dry powder formulation. To administer the glucagon intranasally requires one step (to be performed by a caregiver in treating an episode of severe hypoglycemia): depress the plunger into the device chamber. That single step compresses the air in the device and dispenses the powder into the nose (similar to nasal spray for a cold). The device contains a 3 mg dose of glucagon, higher than the 1 mg dose in a rescue kit. Q: What are the deal terms? Is Lilly responsible for regulatory, manufacturing, commercialization? How are the milestones structured? Q: When will an NDA submission occur? When could it launch? Q: What will the leadership look like for this group? Q: Can Lilly leverage existing glucagon manufacturing for Locemia’s device? Q: How will the price of Locemia’s device compare to current glucagon injection kits? Q: How will payers view Locemia’s device? Q: Will Lilly retire its existing glucagon injection kit business? Q: How will later-to-market glucagon injection devices compete with Locemia’s first-to-market intranasal device? Dr. Michael Rickels presented a phase 3 study (n=75 adults) comparing Locemia’s exciting intranasal needle-free glucagon powder for severe hypoglycemia to standard intramuscular glucagon injection. The randomized, crossover trial at eight T1D Exchange clinics administered IV insulin until blood glucose <60 mg/dl. Five minutes after stopping insulin (mean nadir was ~46 mg/dl), glucagon was given – a 3 mg intranasal dose at one visit and a 1 mg intramuscular dose at the other visit. Notably, Locemia’s intranasal glucagon was non-inferior to intramuscular injection: all subjects responded with an increase in blood glucose, although 1% of the Locemia arm and 0% of the intramuscular arm failed to achieve the primary outcome (an increase in blood glucose to >70 mg/dl OR an increase >20 mg/dl from nadir within 30 minutes post-administration – this seemed like an unconventional endpoint, but it was agreed upon with the FDA). Median time to achieve the primary outcome was 10 minutes for intramuscular injection vs. 15 minutes for intranasal delivery. The five minute delay in pharmacodynamics for intranasal delivery was fairly inconsequential in our view, given the time it takes to prepare a traditional glucagon kit vs. the needle-free, single-button push delivery of the Locemia device. Nausea and vomiting occurred at a similar frequency, though transient head/facial discomfort were more common with intranasal glucagon (25% vs. 9%) – not a major issue given the circumstances under which this would be given. Dr. Jennifer Sherr presented phase 3 results in 48 pediatric patients (4-17 years old) for Locemia’s intranasal glucagon, showing comparable glucose-raising ability vs. injected glucagon. The results mirrored those shown at ATTD 2015 in 75 adults. The primary endpoint – an increase in glucose >25 mg/dl within 20 minutes – was observed with intranasal glucagon in 47/48 treatments vs. 24/24 treatments with intranasal glucagon. The one exception was a patient who blew his nose immediately after receiving the intranasal dose. Dr. Sherr rightly noted that this scenario would be unlikely during a severe hypoglycemia episode. The study also tested two doses of the intranasal glucagon, revealing that the same 3 mg adult dose can be used across the pediatric population. That’s a manufacturing win for Locemia. The intranasal glucagon had a slightly higher rate of head/facial discomfort (17-24% vs. 13%), though a much lower rate of nausea (39-43% vs. 67%). Given the rescue indication, we don’t see those events as truly impactful on the drug’s chances. Q: You have an attractive device. My issue here is you have administered in conscious patients that are able to inhale powder. How about unconscious patients? A: In actuality, the glucagon powder is passively absorbed through the nasal mucosa. Patients do not inhale; that does not help in terms of the absorption of medication. Q: It’s so rare that we have a new innovations in this area. This may really be important. Could it be a useful tool in emergency cars? When will it be on the market? A: I can’t speak to when it will be on the market. The company has been having discussions with the regulatory bodies. I suggest inquiring with them. It will absolutely be useful for emergency settings. Q: What is the stability? Can you store it at room temperature? A: It is stored at room temperature. I believe it has a two-year shelf life. Q: From an adult clinician view, this is great. So often glucagon is not given. What do you think is driving the differences in nausea? A: I cannot say I know. The glucagon concentrations with injected seem to get a little bit higher than intranasal in some cohorts. I don’t know the mechanism behind it. Q: Have you studied variability of absorption? What about stuffy noise due to a common cold? A: Actually, the company did conduct a study doing that. They brought in patients with colds and tested it with and without nasal decongestant. In both situations, the powder was well-absorbed. Q: The insulin infusion was stopped when you reached lower glucose concentrations. How would this affect the response to glucagon, because in a clinical situation, insulin will remain on board? A: We resumed normal basal delivery. We stopped the higher rates to induce hypoglycemia. If someone was on injections, they had their previous basal injection from the prior day. This brilliantly designed human factors study compared use of Locemia’s intranasal glucagon powder to a standard glucagon emergency injection kit in a simulated episode of severe hypoglycemia (a mannequin; details below). The study included two groups to mimic realistic scenarios: (i) people with diabetes that taught a caregiver how to use the glucagon device a week prior to the simulation; and (ii) untrained participants with no connection to diabetes, who were shown the device and then asked to use it on the spot. 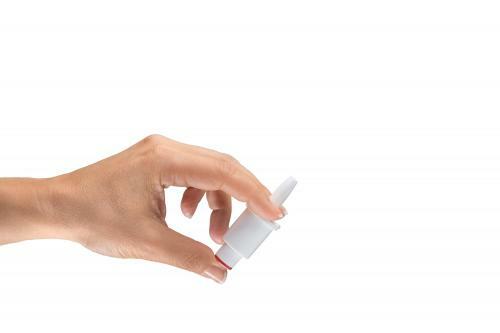 In the key analysis, 94% of caregivers (15/16) correctly gave a full dose of glucagon with the intranasal device, and it took just 16 seconds on average. Conversely, only 13% of the same caregivers (2/16) delivered a full dose with the injection kit and 38% gave a partial dose (6/16); the average time for these eight individuals was 1 minute and 53 seconds, or seven times longer than intranasal delivery. Shockingly, 50% of diabetes caregivers (8/15) failed to deliver any glucagon at all with the injection kit vs. 6% (1/16) with intranasal. Even more frighteningly, two caregivers in the injection group mistakenly used insulin for the hypoglycemia rescue (cleverly included in the diabetes supply bag alongside the glucagon, to simulate a realistic hypoglycemia rescue situation), as they were confused about which injection to use. Whew. The results were equally strong for Locemia in the untrained acquaintance group: 93% success (14/15) with intranasal in an average of 26 seconds vs. 0% success for a full-dose (0/15) and 20% success for a partial dose (3/15) with the injection kit in an average of 2 minutes and 24 seconds. Overall, the results are a slam-dunk for Locemia’s needle-free device, especially as it seeks regulatory approval and future reimbursement relative to existing devices. We’ve always said that injected glucagon kits are burdensome for caregivers, but who knew it was this hard to use them correctly and quickly? The study also revealed an unexpected concern with an injected route of glucagon delivery that is easy to mix up with injected insulin – this could be a strong marketing advantage vs. competitors Xeris and Biodel (who both have pens). The severe hypoglycemia simulation included a fully clothed adult mannequin representing a person with diabetes. Participants were told that the mannequin was having an episode of severe hypoglycemia and that they had to administer the rescue glucagon as quickly as possible. The glucagon rescue device was located in the patient’s backpack, which also contained a diabetes supply pouch (glucose meter and strips, alcohol swabs, lancing device, insulin vial, and syringe). Sound effects and distractions created a sense of urgency – a nice touch. The trained caregiver arm included 16 adult insulin-using people with diabetes and their caregivers. Patients were taught how to use one of the glucagon devices (in random order) and then instructed their caregivers, replicating real-life transfer of information. One week later, caregivers were asked to treat a mannequin during a simulated episode of severe hypoglycemia. The procedure was repeated with the other device. The untrained acquaintance arm included 15 adults with no diabetes connection, but who said they were willing to assist someone in distress. They were not trained on device use and only shown the device prior to the simulation. This group treated two episodes of severe hypoglycemia with the injection kit and intranasal powder in random order, with a delay of about ten minutes between each simulation. Two caregivers in the injection group mistakenly used insulin for the hypoglycemia rescue attributed to “form factor confusion.” An additional two caregivers in the intranasal group and three caregivers in the injection group attempted to give insulin in addition to glucagon “due to misunderstanding of diabetes management” (i.e., “insulin helps the patient with their blood glucose, so I should give that too”). The data simply underscores the tremendous educational challenges related to glucagon, even amongst diabetes caregivers! It was notable to see that untrained acquaintances were able to deliver intranasal glucagon successfully and at a similar rate as trained caregivers. We agree with the poster’s conclusion that it highlights the ease of use of Locemia’s needle-free nasal glucagon delivery system. “Glucagon delivery using a different route and device form than those used for insulin may reduce the risk of confusion and accidental delivery of insulin.” This was a fascinating point we had never thought of, but a realistic one since insulin might be co-located with a glucagon kit. Certainly, this gives Locemia some marketing advantage for injected rescue glucagon competitors Xeris and Biodel. 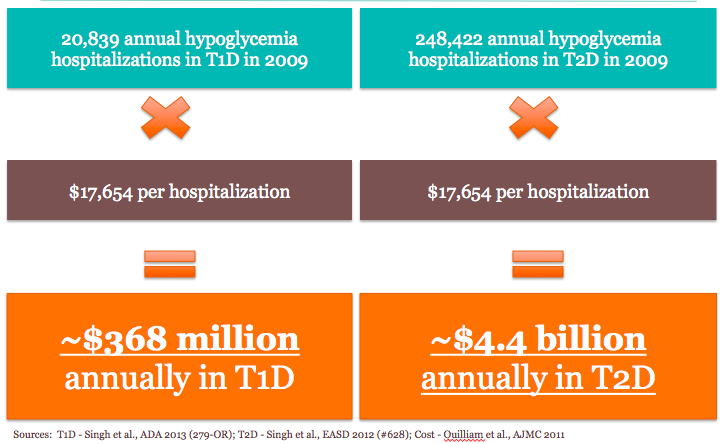 The slide below reflects our best estimate of the annual US cost of severe hypoglycemia. These are taken from Singh et al., ADA 2013 (279-OR) for type 1; Singh et al., EASD 2012 (#628) for type 2; and Quilliam et al., AJMC 2011 for cost.